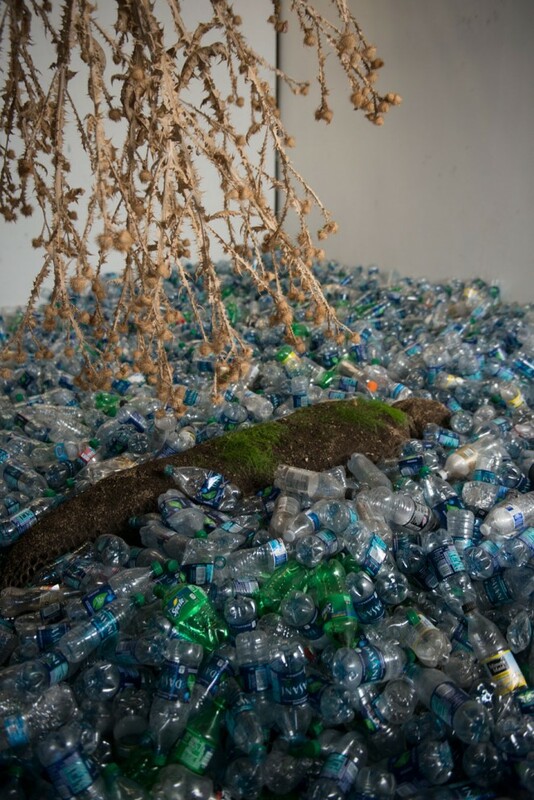 Redemption Value, 2017 – Approximately 6,063 used plastic bottles used in a single football game (BYU vs. UMASS on 11/29/16), hemp twine, commercially purchased soil, commercially purchased grass seed, milk thistle plant, football tickets. I wasn’t sure what this project was to be intended for until I started sifting through garbage. Jake Buntjer, Pete Hansen and Drake Withers came along to help. It was on the campus of Brigham Young University, Provo Utah. This campus is clean and hygiene is well maintained and the students that occupy it also fit this description. We looked like pirates or even workers of the city that came to pick up the trash, well, except for Drake. He was a student of BYU at the time and was the one to suggest that we go to his apartment complex as they separate garbage into various recycling containers. I was looking for discarded plastic vessels to use for something. It took us about 45 minutes to deplete BYU’s bins and fill 12 large plastic bags of our own. These comrades of mine said that we’ll just have to come back next week. I desired as many bottles that my studio could handle. Working with such material gets me down but getting physical and mental support is great help and encouraging. Jake looks at me when we arrived and said, “I love you Kelly Larsen”. I said, “Why? Because I’m making you go through garbage?”. Jake occupies the Boxcar Studios in Provo, Utah , we had all planned a Fall Galla for December 3, 2016. I had about two weeks to make a piece for this show. I questioned where the plastic is taken from the apartment complex. I soon find out that BYU has a recycling facility, so I jump on it. I called the manager, Bill Rudy, and went over for an immediate visit. This place is as ugly and pungent as I hoped it would be. But don’t get me wrong. 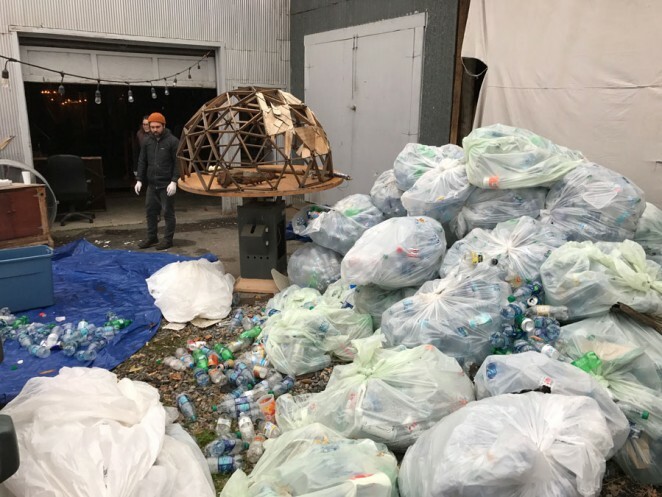 We are just dealing with mass amounts of trash and Bill is obviously on top of it; organizing, managing and in a way producing product that gets sold back to the manufacturer. He segregates the bottles by company and smashes them all down into bails for the most efficient shipping. On Saturday, November 19, 2016 the BYU Cougars football team had a game scheduled with UMASS. 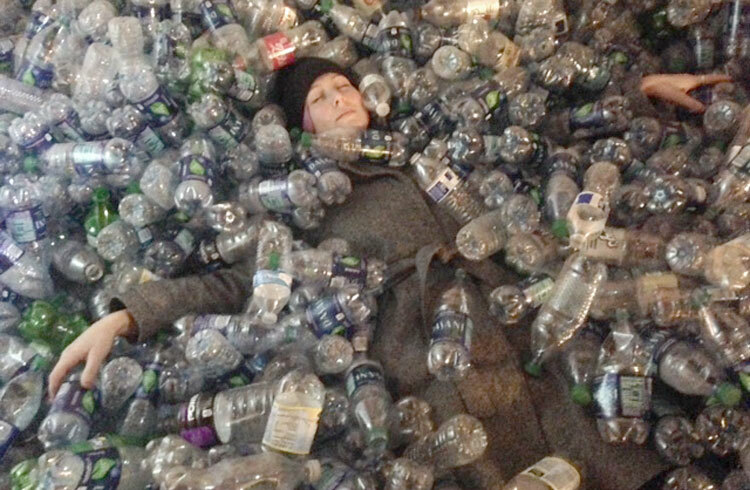 Bill encourages me to wait until the following Monday as he will have attained all the water bottles from that game. I drop my jaw and my mind is filled with an immense satisfaction. This is what the project is about, this is what it became. 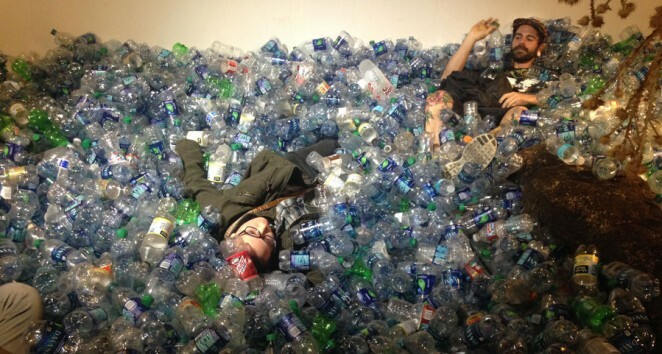 How many bottles are purchased, used and discarded within a few hours by one single event? BYU won the game by 27 to 16. The capacity of the stadium is 63,725. 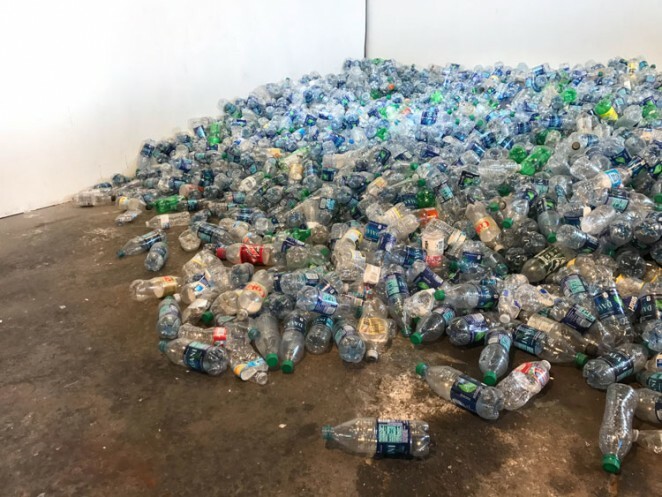 Not only did BYU’s recycling program save hundreds of plastic bags filled with used containers, Nick Arnett, Bill’s assistant, said it would not be an inconvenience just to drive the truck over to my studio and dumb them off. I was filled with joy as it saved me so much time. This is community and this is what I desire to work with. Now I must go through every bag to get rid of the juice and chocolate milk bottles and other random things people throw in recycle bins. My dear friend Eleasah Halsmer put in many hours doing this with me as it began to snow. It became apparent that I must simply throw the bottles in my studio as they were. Not organizing them in a sense of aesthetic attraction: not to display them in a shape or design that would dazzle ones eyes. I simply desired to throw them in a pile on the ground as in a landfill. I don’t think I got all what was purchased since some people throw recyclables in landfill trash and take home what is left in their bottle. The purchaser for concessions for the university is Aaron Black. He verified that 5,140 Dasani bottles were purchased at the BYU vs UMASS game that day. He said they have a “deal” with Coca-Cola. 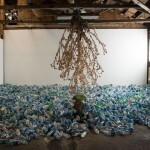 From this project, I have gained a curiosity of what is involved in the life of 5,140 water bottles. How many toxic chemicals are used to make them and what waste is made doing so. How many gallons of gasoline does it take to ship to the warehouse and then to the purchasers warehouse and then to the event. 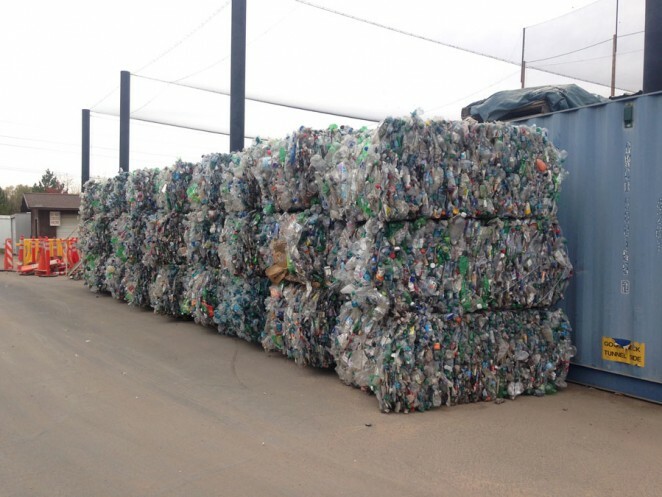 The life continues at the recycling facility and then back to the manufacture to be melted back down. How many chemicals are leached into the water that is consumed? “Bags larger than 12″ x 12″ x 12″, any food/drink (including bottled water), video cameras, umbrellas, cans, containers, cooler, artificial noisemakers, megaphones, flags, sticks, poles, other large items, large signs, banner, whiteboards, laser pointers ARE PROHIBITED. ALL GUESTS SUBJECT TO SEARCH”. Meaning you must purchase what they offer. This university is capable of great things. I see the extreme short (usable) life of the water bottle a problem and should be resolved by installing refillable water stations throughout the stadium. In this project, I have included a crochet human body form that is filled with commercially purchased dirt and covered with commercially purchased grass seed. The native milk thistle plant that suspends upside down offers the inclusion of hope and its use for phyto-remediation. The Fall Gala at Boxcar Studios on December 3, 2016 was a great success. 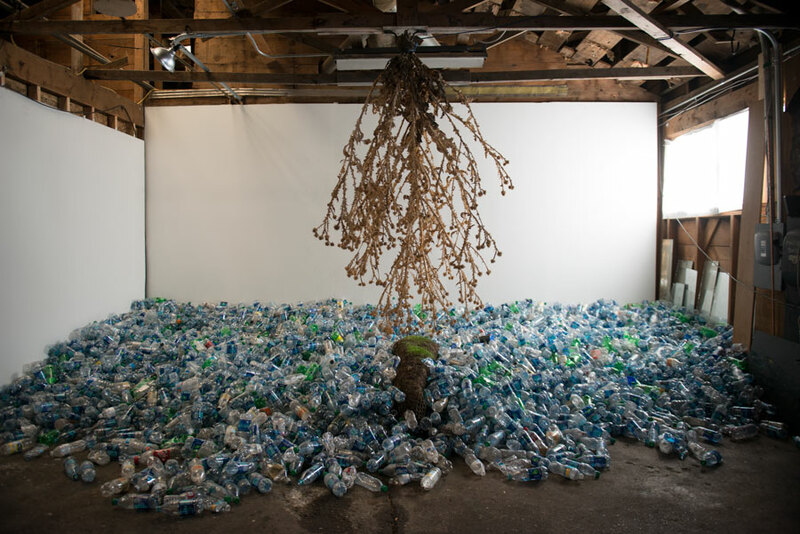 The entire community was invited to view the work presented by all seven artists that occupy this space. Redemption Value 0 became interactive, loud and exciting like a football game as people were invited to walk through the bottles. Many fell into them like a pool of balls. Many found them comforting to get buried in them and lie for awhile. I find it disturbing that we consume so much, so fast.